A couple of times every year, a well-meaning mainlander, someone who believes he’s an islander “at heart” because he “loves the ocean,” calls Matinicus Island with some business or other. This tightly scheduled do-gooder wants to observe our one-room school or meet the town fathers or fix all our problems. “Don’t fish, can’t afford it,” we explain. Safe year-round transit across 22 miles of leaden sea would require considerably more boat than the open summer runabout he’s no doubt envisioning. Oh, if it’s foggy or raining or snowing or the wind is blowing too hard out of the wrong direction or the island’s dirt airstrip is too muddy. A passenger has to “make a flight” with the air service. That means make a reservation in a tentative sort of way. You have to work around the weather, mail flights to other places, and the occasional medevac flight and aircraft maintenance. On Matinicus, “You can’t get there from here” isn’t lame Maine humor; it’s a weather report. Yes, they might, but this isn’t like college. There’s no ride board where people stick a little note, “Am going to Bangor on Saturday, would like to share gas.” Lobstermen have no reason to call half the neighborhood just because they have plans to steam across the bay to buy rope and beer. Here’s a scenario most of us on Matinicus have experienced. After doing your mainland shopping, you wait four or five hours at the Knox County Regional Airport, hoping for a window in the spiteful weather. You make multiple phone calls back to the island to ask about the fog and the ceiling, or the likelihood of finding someone on the mainland going home by boat today. “Where does he go out of?” “I don’t know. Spruce Head, I think.” (There’s a mythology that residents of an island community know where everyone is and what they’re doing, all the time.) Convinced that this is actually going to happen — that you will sleep in your own bed tonight — you now have 15 minutes to get from Owls Head to Spruce Head. You organize the children and dogs, pull the milk and pork chops from the airport cooler, and head down Route 73 in a harried hurry. In Spruce Head, there’s too much fog to see any distance. Is he here? Is he not here yet? Was he ever here? Did he leave already? You’re also now wondering where you’ll leave your vehicle for the next few weeks. Yes, weeks. When you live on Matinicus, you can’t go to the mainland every time you need a can of beans. Freelance writer Eva Murray ’86 moved shortly after graduation to Matinicus, where she and her husband have raised two children. 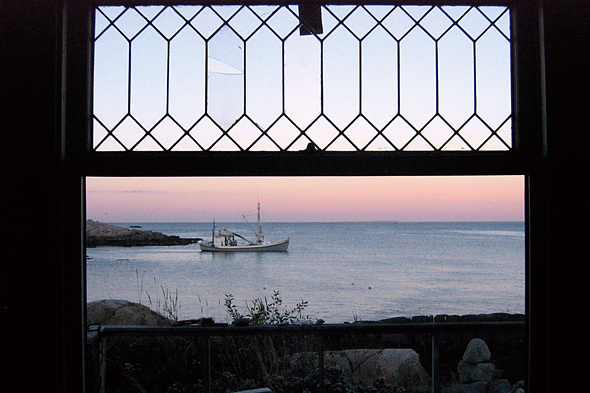 This essay is adapted from “Getting Here is None of the Fun,” which first appeared in Maine Boats, Homes & Harbors and is included in Murray’s collection of essays, Well Out to Sea (Tilbury House, 2010).